After the most talked-about race for years, Andrew Frankel laments that a flying circus distracted attention away from BMW's win, and predicts new players in this ever-enthralling arena. I can't remember ever before feeling sorry for the team that won Le Mans, but as I left the track this year, my heart went out to Gerhard Berger, Charly Lamm, the drivers, engineers and mechanics of BMW's works Le Mans effort. They had won the race the way it is almost always won: by being slickest, not quickest. It was BMW's first win in the event and it came in the face of outstanding competition. And yet in the days since the flag fell, not one person, reader, colleague or friend has rung or written to discuss what was a richly deserved win. 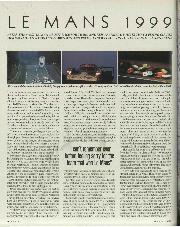 This despite the fact I cannot remember when the 24-hour race last provoked so much debate. This was an unusually gruelling race, and the first of the recent era where fatalities were avoided more through good fortune than anything else. The event woke you up to the dangers of racing, and racing here in particular; by the end Thierry Boutsen, JJ Lehto and Peter Dumbreck, a representative from each of the top marques, all had cause to be thankful their races ended only in a trip to hospital.